Kansas City is in the midst of a record-breaking allergy season. We noticed weed pollen in the air early this year. 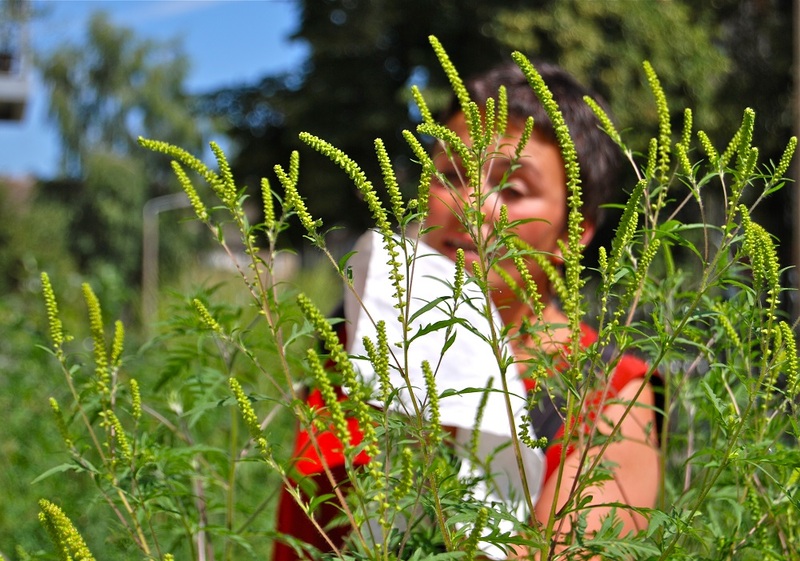 By the end of the first week of August, pollen was detected, setting up allergy sufferers for the wrath of ragweed. Ragweed pollen, as well as all plant pollen, depends on daylight and temperature to trigger the release of pollen. Typically we see ragweed pollen counts appear in the middle of August and they finally drop in late October. Ragweed likes to grow close to water, such as rivers and streams. The seeds contain oil and birds love to eat them, spreading them everywhere. Ragweed grows plentiful in certain regions of the United States, along with its strong ability to stimulate the release of histamine. Having ragweed allergy makes people miserable. Ragweed allergy sufferers complain of itching and burning of the eyes, nasal congestion and rhinorrea, nasal blockage and snoring at night, adding to the fatigue that the release of histamine can cause. Couple these symptoms with headaches, wheezing if you have asthma, and of course the end of summer and the beginning of the busiest time of the year, school starting and you’ve got a real mess on your hands! Staying indoors is a good way to avoid ragweed, but that’s not always possible. Driving in an air-conditioned car will not protect you, so taking medications or receive immunotherapy (allergy shots) is the only way to survive this time of year. There are many over-the-counter options, such as the oral antihistamines: Loratidine, Fexofenadine, Ceterizine can be taken daily. Add Nasacort steroid nasal spray, and Ketotifen antihistamine eye drops if needed. Something new for allergy sufferers 18 and older is Ragwitek, this is a dissolvable tablet that you place under the tongue daily for three months before ragweed season, and the two and a half months during ragweed season. You still may need to take the antihistamines, nose sprays to help handle the ragweed. Unfortunately, it won’t help you for this year, since the season has already started. The best option to really feel allergy-free is to receive allergy injections. They are applied weekly for six months, and then every other week, then every third, and eventually you just receive them once every sixth week, which is just eight injections per year. After five years of injections, “high dose” immunotherapy will often cure patients of your allergies, help reduce asthma problems, and allow you to play outside without the need for any medications. It also is the only good way to stop the fatigue and run-down feeling that ragweed causes. Enjoy the fall season by exercising early in the morning before the sun heats up, or late at night. Shower after being outside is important. Taking your inhaler if you have asthma is also helpful before walking or exercising. Keeping the windows closed and the air conditioner on is a must. Some people like to wear goggles or special sunglasses with wind protection to keep their eyes covered. Pets will also carry the pollen indoors, too, so brush them off before they sit on your furniture. Speaking of pets, some pets do show allergy symptoms, since they are low to the ground and sniffing in the pollen. The animals that are allergic are more vulnerable. Dogs may scratch and chew their paws; their eyes may even swell shut. Some veterinarians will recommend diphenhydramine (Benadryl), cetirizine (Zyrtec), or chlorpheniramine to treat allergies. And of course washing off the pollen and keeping them indoors is also helpful. Taking a preventive, proactive approach can help you withstand the ragweed season, which looks like it may be a record season here in the Kansas City area. Don’t hesitate to contact us if you have any questions at all.